Kauto Star was a National Hunt race horse who had a glittering career under trainer Paul Nicholls, displaying grit, determination and immense talent along the way. He was trained at Manor Farm Stables in Ditcheat. The horse first came to the attention of Nicholls after he saw a clip of it racing in France, where Kauto Star’s career had first started. Through his bloodstock agent Kauto Star was purchased for 400,000 euros, and faith was soon rewarded by an easy class 3 Newbury win. After a few racing ups and downs, it was the 2006/2007 season that really showed Kauto Star’s ability with wins in the Betfair Chase and Tingle Creek Chase. Stand out achievements of the champion racecourses career include winning the King George VI Chase five times, and being the first horse to ever regain the Cheltenham Gold Cup title. Kauto Star started the 2007 Cheltenham Gold Cup as a short 5/4 favourite, ridden by Ruby Walsh. He delivered on expectations, and as he’s already won the Betfair Chase and King George VI Chase, this win completed the third and final leg of the ‘Betfair Million’ earning a £1,000,000 bonus for the victory (his total career prize money including this was over £3.7 million). Starting favourite again in 2008, he was handily beaten by second favourite Denman. In 2009 Kauto Star had his revenge over Denman winning by a huge thirteen length margin. Kauto Star was the top rated steeplechase horse in four seperate years, and this point is pushed home by his Timeform rating, which places him joint fifth best steeplechase horse since the 1960s. 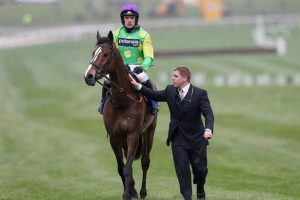 The end to Kauto Star’s story is unfortunately a sad one. In 2015 we suffered severe injuries following a fall in the paddock and had to be put down. His brilliance will however always live on in the hearts of racing fans.